If you need a fleece jacket, a leather or denim jacket or a blazer, there is an abundance from which to choose. 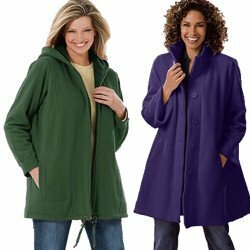 Plus Size Women's Jackets are available from the most casual to very dressy in lengths from cropped to longer hip length and in just about every fabric and style you can imagine. The biggest challenge in shopping for plus size jackets is knowing your body type as well as having a little fashion savvy. 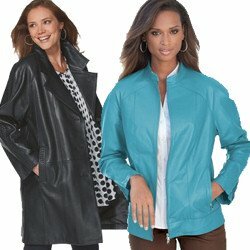 There are plenty of very flattering jacket styles available in the plus size market these days, so you won’t be limited on selection. What’s really important is getting the best fit. The first thing about getting the right jacket is your height. The taller you are, the longer your jacket can be. Shorter women need to reach for jackets that don’t swallow them. So avoid a full length choice and look to ¾ jackets instead. On a tall frame you have more flexibility but remember what types of clothing you intend to wear with your jacket. 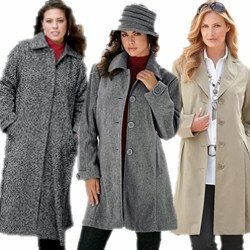 V-necked plus size jackets give you a longer line. This style creates the illusion of a slimmer body. Also jackets that button or cross over help give your waist more definition. One button or belt will do the trick here. This particular jacket is very helpful for apple-type bodies and it really dresses up your overall look. If the jacket you like doesn’t have a V neck, pair it with a V-neck shirt instead. Tailoring really matters in plus size jackets. Look particularly at the back. The better your jacket fits you, the more it accents the best of your attributes. 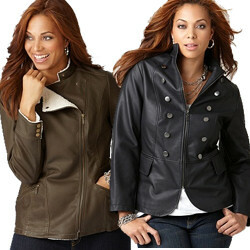 If you have a pear shaped body look for jackets that emphasize your arms and waist. Shorter jackets that don’t go beyond the hips achieve the desired for the pear shaped gal. Hint: a plus size jacket is only as good as your support system. Don’t skimp on a good bra. This gives form to the jacket and lets you see what the piece was really intended to look like. So what about other body types? Well, if your waist, shoulders and hips are all relatively alike you need to try and bring curves to a straight line. Look for jackets that have belts and avoid layering your clothing too much. By comparison, a woman that has a wedge body can look for a jacket with details near the neckline instead. There are some other good tips for buying a plus size jacket. For one, consider darker colors. These are more adaptable to a varied wardrobe and also slimming. If you want a print, keep it small and tasteful as larger prints make you look bulky. And unless necessary don’t combine your jacket with heavy sweaters and sweat shirts. By following these basic guidelines you’ll be able to select a comfortable, fashionable plus size jacket perfect for your body and your lifestyle. Better still, it will highlight your best features without a lot of fuss.